Left: Legends Romona Keveža Style L7179 unveiled at New York Bridal Fashion Week on October 6th, 2016. Right: Pippa Middleton on her wedding day May 20th, 2017. For the third time in recent history, American bridal designer Romona Keveža has channeled her royal intuition to anticipate some of today’s most noble nuptials with gown designs that precurse the eagerly awaited events themselves. On May 20th, 2017, Pippa Middleton wedded James Matthews in a lace gown baring striking resemblance to the Legends Romona Keveža Fall 2017 dress (shown above left) which unveiled last year on October 6th, 2016 at New York Bridal Fashion Week. The lace sweetheart neckline full skirted gown can be worn with or without its matching lace jacket with full crew neck collar and cap sleeves. off-the-shoulder silk gown which was nearly identical to the Princess’s save for the mother of pearl embroidery. Coincidentally enough that same year, on April 29th, 2011, the Duchess of Cambridge Kate Middleton stepped out of her carriage revealing to the world a dress similar to exactly what Keveža had envisioned. A Legends Romona Keveža A-line gown specifically pre-designed with the Princess in mind had also debuted earlier that month at New York Bridal Fashion Week on April 9th, 2011. Left: Legends Romona Keveža Style L242 debuted at New York Bridal Week on April 9th, 2011. 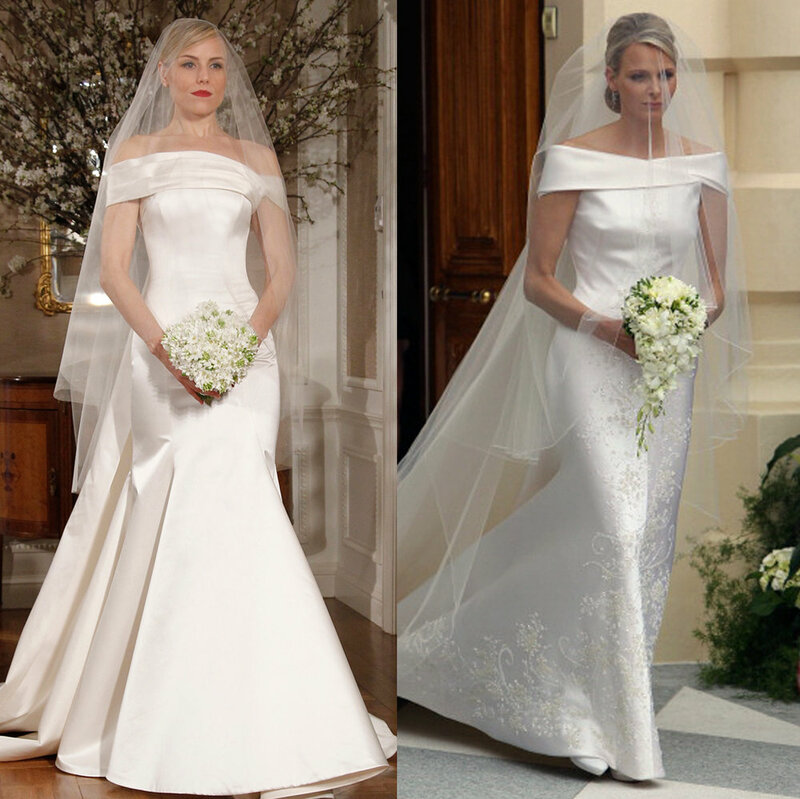 Right: Charlene Wittstock, the Princess of Monaco on her wedding day July 2nd, 2011. Left: Legends Romona Keveža Style L249 unveiled at New York Bridal Fashion Week on April 9th, 2011. Right: Her Royal Highness Katherine The Duchess of Cambridge on her wedding day April 29th, 2011.